Thankfully, the Yankees also lost. 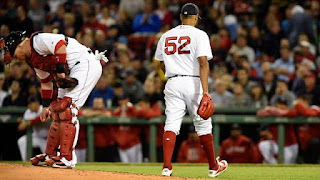 The Red Sox, who are limping their way to the finish line, were embarrassed by the Houston Astros 12-2 at Fenway Park on Thursday night. The Magic Number to clinch the American League East pennant was reduced to one courtesy of a Yankee implosion against the Rays in the Bronx. Eduardo Rodriguez (pictured), allegedly in consideration for a spot in the playoff starting rotation, didn't get out of the second inning. He lasted just 1.2 innings and was charged with five runs. Reliever Blaine Boyer wasn't much better, allowing four runs in 1.2 innings as well. There were very few (any?) bright spots for the Red Sox. Xander Bogaerts had two hits and Mitch Moreland socked his 22nd home run of the year in the second inning. After that? You were better off looking for your Four Days In October DVD. Rodriguez was the fourth straight Boston starting pitcher to allow five earned runs. So much for a late-season push. The Yankees play the Blue Jays Friday afternoon in the Bronx. A New York loss would clinch the division for the Red Sox. Heaven knows we can't depend on the Sox to win.